The month started quietly with a period of contemplation on the terms of the interim agreement on citizens' rights, the Irish border and the financial contribution and ended in a ruckus with BuzzFeed's publication of a leaked government memo that predicted bad outcomes for every type of Brexit (see Alberto Nardelli This Leaked Government Brexit Analysis Says The UK Will Be Worse Off In Every Scenario 29 Jan 2018 BuzzFeed). That led to ministers' dissing their own civil servants and a back bench Tory MP accusing HM Treasury of all kinds of skulduggery. 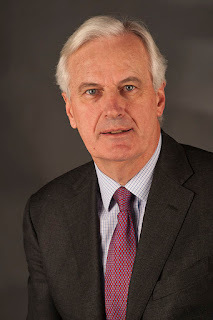 That same back bencher provided the only drama of the month when he asked the Secretary of State for Exiting the European Union whether the UK would be a vassal state between 29 March 2019 and 31 Dec 2020 at a hearing of the House of Commons Select Committee on Exiting the European Union on 24 Jan 2018 (see Will the UK be a Vassal State during the Implementation Period? 30 Jan 2018). Surprisingly Mr Davis came close to admitting to the committee that it would though only for a short period. Mrs May subsequently intervened to say that we would not admit new arrivals from the EU member states on the same terms as before and that we would seek a new mechanism to challenge any new laws that would harm our interests. In other words we can have a free trade agreement and it may even have some provisions for the supply of services but it will fall far short of the frictionless trade conditions that we now enjoy (see Davis and Barnier set out their Negotiating Strategies for the Next Phase of Brexit Talks 11 Jan 2018). On 17 Dec 2017 Daniel Alexander QC, Chair of the Intellectual Property Bar Association, together with the Chair of the IP Law Committee of the Law Society of England and Wales and the Presidents of the Chartered Institute of Patent Attorneys, the Chartered Institute of Trade Mark Attorneys ("CIPA") and the IP Federation, signed a memorandum to the Government entitled Intellectual property (IP) law and Brexit Summary of main requests for the UK government a copy of which can be downloaded from the CIPA website (see IP and Brexit - Key Requests to Government). One of those requests is ratification and continued UK participation in the Unified Patent Court but that looks increasingly unlikely as exit day approaches. The question for now is what if anything can be salvaged from the UPC Agreement. I wrote about that topic on 26 Jan 2018 in NIPC Law and I am due to talk about it to Queen Mary University London on 12 Feb 2018 (see Implications of Brexit on Intellectual Property Law 19 Jan 2018 NIPC Law). Anyone wishing to discuss this article or Brexit in general should call me on +44 (0)29 7404 5252 during office hours or send me a message through my contact form.